Now that Pope Francis has politicized the Catechism of the Catholic Church (CCC-1994) we can ask if there are other passages which need to be removed or clarified.Especially those which come from the New Theology of Pope Benedict .It is based on an irrationality and is not part of the Deposit of the Faith.It is flawed at the onset. There is a big problem here at CCC 846 and 1257. It is Cushingite.It is false. 'all salvation comes from Christ the Head through the Church which is his Body', this is a cop out. It is accommodating the New Theology.It suggests there are other known means of salvation which are the same as the baptism of water.New Sacraments? A new revelation? They are the baptism of desire(BOD), baptism of blood(BOB) and being saved in invincible ignorance(I.I) - and much more, many others.Vatican Council II has expanded on the list, LG 8, UR 3, GS 22, LG 16 etc. There are no such cases in our reality.This is the bottom line. There are no known cases of BOD, BOB and I.I for them to be exceptions to EENS. We cannot give any one the BOD, BOB and I.I as we can administer the baptism of water. We cannot physically see a BOD, BOB and I.I case as we can physically see someone receiving the baptism of water.So all this must be kept in mind when reading the Catechisms. BOD, BOB and I.I like LG 8, NA 2 etc are not relevant or practical exceptions to the dogma extra ecclesiam nulla salus(EENS). Secondly, EENS was a dogma and not just an 'affirmation'.Cardinal Ratzinger was probably following an agenda of the Masons. He had to discard the dogma EENS from the Catholic Church at any cost.So he used a false argument. As Prefect of the Congregation for the Doctrine of the Faith it was his responsibility to correct the error through the Catechism or a Notification. Similarly it was his responsibility to tell Archbishop Marcel Lefebvre and the SSPX bishops that LG 8, LG 14, LG 16, UR 3, NA 2, GS 22 etc refer to only hypothetical cases. So they are not relevant or exceptions to the past exclusivist ecclesiology of the Church.Vatican Council II does not contradict what was then known as Feeneyite EENS. Instead he maintained the lie. This is deception. It is still is being continued today even after they have been informed. So the Catechism needs to clarify at 846 that the Church still holds the traditional interpretation of the dogma EENS and there are no known cases of BOD, BOB and I.I in our reality, as exceptions to EENS.Since they are not objective they cannot be practical exceptions to the past ecclesiology of the Church.They do not contradict the Syllabus of Errors on an ecumenism of return. 'This affirmation is not aimed at those who, through no fault of their own, do not know Christ and his Church'- another empty argument. We do not know of any one who will be saved, or is saved, in invincible ignorance, through no fault of his own.If such a person is in Heaven we cannot see him.So there is no such person who is an objective exception to the dogma EENS.To suggest otherwise here violates the Principle of Non Contradiction.I cannot see someone in Heaven and on earth at the same time. CCC 847 has nothing to do with the dogma EENS as it was known to the missionaries in the 16th century or as it was interpreted by Fr. Leonard Feeney and the St.Benedict Center.The confusion is being strengthened here. Similarly CCC 848 also refers to those in invincible ignorance as if this is relevant or an exception to the dogma EENS, as it was known to St. Augustine and St. Thomas Aquinas. But St.Thomas Aquinas did not state that 'the man in the forest' in invincible ignorance referred to a known person. It obviously was a hypothetical case.This is a given. Aquinas also said that if that man in the forest was saved then it was because God had sent a preacher to him. The Catechism can clarify that being saved in invincible ignorance does not refer to people we know or can know.All who are saved can only be seen by God.We physically cannot see someone in Heaven saved with BOD, BOB and I.I and without the baptism of water. This error is part of the new Cushingite theology, the new theology, which has come from the objective error in the Letter of the Holy Office 1949 and which was repeated in Vatican Council II. 1257 The Lord himself affirms that Baptism is necessary for salvation.He also commands his disciples to proclaim the Gospel to all nations and to baptize them. Baptism is necessary for salvation for those to whom the Gospel has been proclaimed and who have had the possibility of asking for this sacrament. Lionel:Baptism is necessary for all in general and not only to those to whom the Gospel has been proclaimed and who have the possibility of asking for this Sacrament.At CCC 1257 we have the New Theology of Rahner and Ratzinger being enforced. They did it by first assuming there were known non Catholics saved outside the Church without the baptism of water. They then inferred that these known people saved outside the Church, were examples of salvation outside the Church and so were relevant to the dogma EENS.So the dogma EENS became obsolete for Rahner and Ratzinger. HYPOTHETICAL POSSIBILITY CONSIDERED A KNOWN REALITY IN THE CATECHISM AND SO IT IS MENTIONED. A hypothetical possibility was considered a known reality.The error of known people saved outside the Church in invincible ignorance was inserted in Vatican Council II as if these people were as real as to those whom we give the baptism of water.So the Catechism here does not state that every one needs to enter the Church.It contradicts and re-interprets St. Thomas Aquinas and St. Augustine. The new doctrine based on Cushingite theology states that only those 'who know', who are not in ignorance, and who have had an opportunity to receive it, need the baptism of water.This is a false doctrine an innovation with false reasoning.It is based on the false premise and the violation of the Principle of Non Contradiction in the Letter of the Holy Office 1949. The Church does not know of any means other than Baptism that assures entry into eternal beatitude; this is why she takes care not to neglect the mission she has received from the Lord to see that all who can be baptized are "reborn of water and the Spirit." God has bound salvation to the sacrament of Baptism, but he himself is not bound by his sacraments. Lionel: 'God is not bound by his sacraments' is another phrase from the New Theology. Can we know any one in 2018 who will be saved outside the Church, since God is not bound to the Sacraments? No!.So why is it mentioned here? Since hypothetical cases had to be assumed to be non hypothetical and real people and in this way the dogma EENS could be discarded and a way opened for the one world religion. This false reasoning, Cushingite reasoning is deception. It is still maintained by Pope Benedict, Cardinal Ladaria, Cardinal Schonborn and the pro-Left ecclesiastics who have made heresy and schism the norm for the average Catholic to follow. They had to wrongly project Vatican Council II and the Catechism of the Catholic Church as a rupture with the dogma EENS.But we can still undo their errors personally, even if no clarification or correction is officially made.The dogma has a way of asserting itself on to reality independent of us human beings.Everytime it is put down it comes up again. Inspite of these errors the Catechism of the Catholic Church and Vatican Council II can be interpreted in harmony with the strict interpretation of the dogma EENS.We simply have to be aware of the hypothetical statements and not project them as objective and known people saved outside the Church. We are back to the old theology and ecclesiology and will have undone the work of Rahner, Ratzinger and the others.We do not have to create a new theology or add any thing new. Lionel: They refer however to hypothetical cases for us. Since even if someone was saved as a martyr, only God would know his condition in Heaven.We cannot say that any one in particular will be saved with martyrdom and without the baptism of water.We cannot say that there is someone in particular in Heaven saved as such and we know him personally.The Church can declare someone a martyr but not say that he or she is in Heaven without the baptism of water, contradicting the ordinary means of salvation. So until there is a clarification and the error is corrected we can make a note not to interpret hypothetical cases as being objective exceptions to EENS.There are not known exceptions we must remember to the teaching on all needing to be members of the Catholic Church to avoid the fires of Hell. Hypothetical possibilities, theoretical speculation must not be projected as a rupture with the old, strict interpretation of the dogma EENS, as it was known up to the 1930. This was the EENS known to St.Maximilian Kolbe and it was there in his work as an edior and in catechesis at his Cities of Mary( Niepokalanov). UNKNOWN CATECHUMEN IS NOT AN EXCEPTION TO EENS AS IT WAS FORMULATED BY THE CHURCH FATHERS. Lionel: He is referring to the case of the unknown catechumen who is theoretically saved as such. This is speculation with a lot of good will. Things hope for.With reference to EENS it is a dud. It is an empty. It has nothing to do with the dogma EENS 'as it was formulated by the Church Fathers', the Medieval Fathers and the Catholic Church up to the early 1940's. Lionel: Yes and all need to enter the Church as members for this salvation. 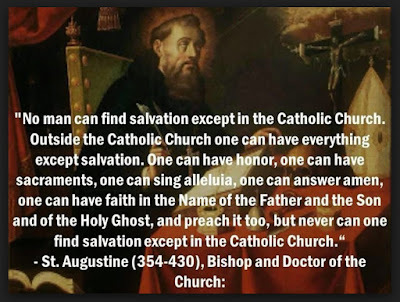 Salvation is open for all in general, Jesus died for all, but to receive this salvation all need to believe in Jesus and live his teachings in the Catholic Church. Outside the Church there is no salvation, there is no known salvation outside the Church. Redemptoris Missio and Dominus Iesus was written with the New Theology as was the Catechism of the Catholic Church. 1261 As regards children who have died without Baptism, the Church can only entrust them to the mercy of God, as she does in her funeral rites for them. Indeed, the great mercy of God who desires that all men should be saved, and Jesus' tenderness toward children which caused him to say: "Let the children come to me, do not hinder them,"allow us to hope that there is a way of salvation for children who have died without Baptism. All the more urgent is the Church's call not to prevent little children coming to Christ through the gift of holy Baptism. Lionel: They go to Limbo. The International Theological Commission paper, 'The Hope of Salvation for Infants who die without being Baptised' had its shaky foundation on the same irrational New Theology. First Cardinal Ratzinger and Fr.Luiz Ladaria sj, made a mistake when they thought that BOD, BOB and I.I referred to known non Catholics saved outside the Church. There are no such visible people. Then they inferred that these practical exceptions to EENS, known to God and man ,were exceptions to traditional outside the Church there is no salvation.So they created new slogans like 1) the Anonymous Christian,2) all who are saved are saved through Jesus and the Church,3) God is not limited to the Sacraments, 4) the unknown case of the baptism of desire and blood bring about the fruits of the baptism of water and are Sacraments.This is their personal theology. These are personal opinions and not magisterial . Since the Holy Spirit cannot make an objective error. .They then went further and said in this ITC paper that unbaptized babies do not go to Limbo or Hell but can be saved or are saved. They left the issue undecided but allowed Catholics to believe that these babies go to Heaven. So since Pope Francis is changing the Catechism teaching on the death penalty, which was part of the Left's campaign over many years, he may also in future change the reference to the Catechism saying homosexual acts are 'intrinsically evil'. It would be unlikely that the Masons and the rest of the Left will allow him to correct the errors in the Catechism of the Catholic Church on Outside the Church there is no salvation (846) and The Necessity of Baptism(1257).But when reading the Catechism of the Catholic Church, we can avoid the mistaked.Do not create a rupture with Tradition on EENS, Syllabus of Errors, past exclusivist ecclesiology, traditional mission motivation etc.This of course, would be exactly what the Left, who represent Satan, want.